One of the prettiest of flowers in the world is the hibiscus, and there are over 200 varieties of these beautiful flowers which come in many colours and shapes. The large flowers are a cynosure of all eyes; they can easily be crossbred to create new colours and shapes. The colours range from red, yellow, maroon, white to pink and mauve. The traditional red coloured flowers are a favourite for use in worship. It is used as an offering to Goddess Kali, and many Durga and Kali temples always have hibiscus flowers growing in profusion. Modern entrepreneurs have found new uses for the flower. Harkirat Chaudhry, a wedding planner who uses a number of interesting flowers, including the auspicious hibiscus in her wedding themes, reveals a trick for dinner floral arrangements: “The flower blooms in the morning and dies in the evening. What one could do is to pluck the bud early in the morning. Put it in a plastic cover and keep it in the refrigerator, and place it in the flower arrangement just before dinner is served. One can actually see the flower bloom during dinner, which is a beautiful experience,” she says. In India alone, there are over 70-odd varieties and several of them are edible. The most popular of the varieties is Hibiscus rosa-sinensis. It is also known as China rose, gudhal in Hindi and bunga raya in Malay. In fact, Hibiscus rosa-sinensis is the national flower of Malaysia. An old wives tale, popular in south India, is to use hibiscus flowers for the hair. The flowers are heated or boiled in coconut oil and then left in the oil. The oil is said to blacken hair and prevent it from greying. The leaves of hibiscus trees are also used as a shampoo as it leaves the hair soft and shiny. Ayurveda recognises the hibiscus flower as an important source for hair growth. The leaves, roots and flowers have various medicinal properties. According to a study published in the Journal of Functional Foods in January 2016, the overall antidiabetic activity of the flowers was comparable with the standard anti-diabetic drug metformin. In a paper published in the Journal of Traditional and Complementary Medicine in January 2017, the extract of the petals in water can help treat skin cancer. The researchers found that the flower extract contains compounds that inhibit melanoma cell growth. The effect was visible even at concentrations that did not affect the growth of non cancerous cells. Dried hibiscus flowers are a common source for dyes. Simmering the flower lightly gives off a light purplish colour. Boiling it darkens the flower and turns the liquid black. Dried flowers become deep purple and the dye is also of the same colour. It is said to be used for hair colouring. It is also used as an eco-friendly dyeing option for fibre, yarn and fabric. The hibiscus is an edible plant. The Chinese pickle the flowers and the Hawaiians consume them raw. Studies reveal that it has various medicinal properties, including lowering sugar levels, promoting hair growth and bringing down levels of acidity. A study published in Fitoterapia in February 2008 says, “The ethanol extract of flowers of Hibiscus rosa-sinensis at doses of 250 mg/kg and 500 mg/kg significantly reduced the blood glucose level in both acute and sub acute treatments.” A study published in the Asian Pacific Journal of Tropical Medicine in November 2011 says the extract of hibiscus can be used to treat peptic ulcer. It is probably because of these reasons that hibiscus tea is widely used as a beverage the worldover. It can be consumed both as cold tea or iced tea or the typical hot herbal tea. 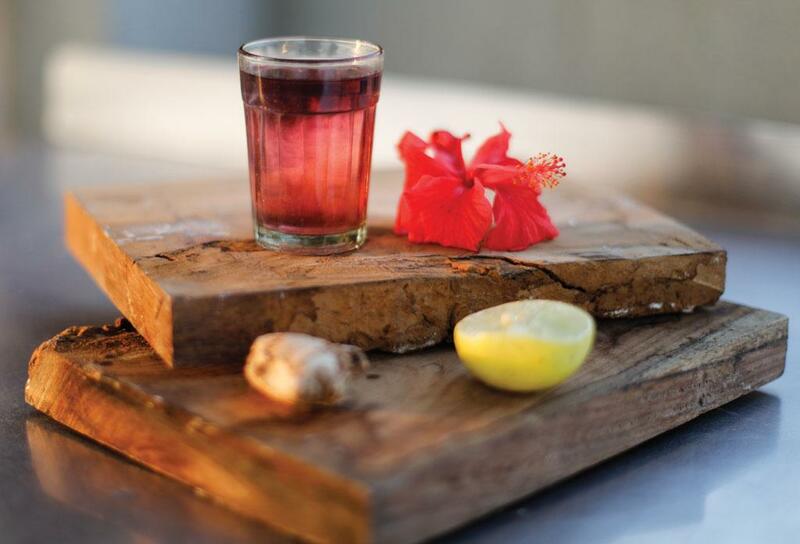 Hibiscus tea forms a popular part of the alternative herbal tea segment. Herbal teas are today in huge demand and hibiscus tea is de rigueur for popular brands. However, studies have shown the potential of the hibiscus flower extract to prevent pregnancy. A study published in Planta Medica says the flower also has anti-fertility properties. Therefore, it should be consumed with caution and should be avoided during pregnancy. Ranveer Brar, a celebrity chef from Lucknow who hosts popular cuisine shows, has a signature floral recipe wherein fresh flowers of gulmohar, lotus petals and whole hibiscus flowers are fried akin to fritters. The base of the dish is the ubiquitous besan/gram flour mixed with onions, dried man-goes, salt and chilies. Take a few petals of the flower and steep it in hot water. Soon it will discharge a deep purple colour. After the colour has steeped into the water, filter it. Add sugar to taste. A hot piping soothing tea is ready. Mint, ginger or a couple of drops of lemon can be added to it. The same can be made into an iced tea also. Instead of using fresh flowers, one can also use dried petals. (This article was first published in the December 16-31 issue of Down To Earth under the headline 'Hibiscus bloom').